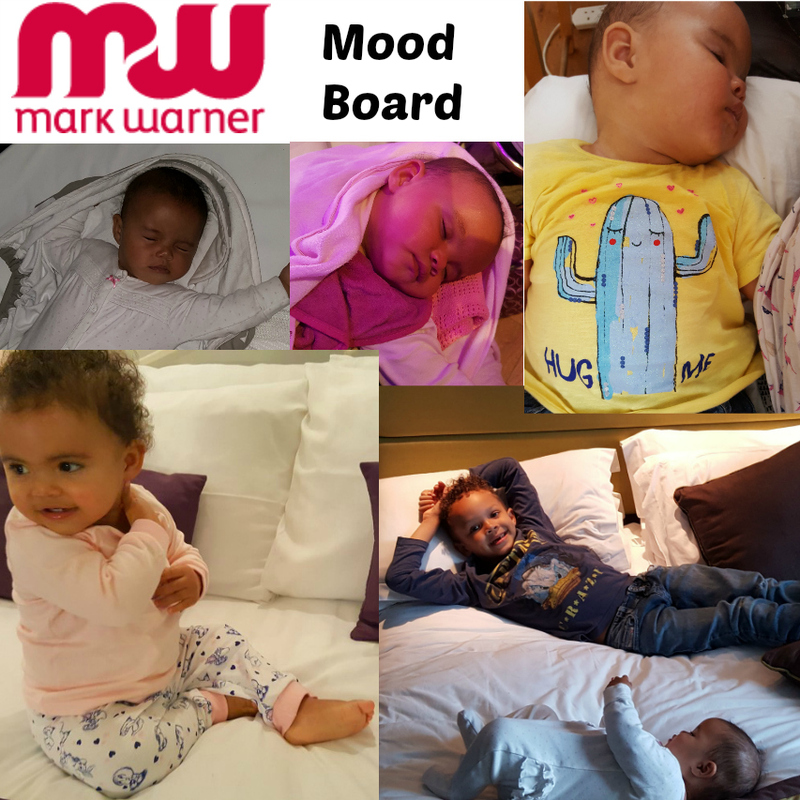 When I read the brief for this year's Mark Warner family ambassador programme I immediately read Mood Board as MOOD (happy/sad) board, even though I know what they do represent in reality, like in say the fashion industry for example. I worked in Monsoon Accessorize Head Office for over 4 years and often had cause to visit the brand floors - their mood boards were exquisite and inspirational for sure - nothing like seeing a designer at work and they had loads that were inhouse. My take on the theme inspired me to do lots of drawings in recent weeks. But, with Lottie being ill I hadn't got near the computer, to execute any of them, so every day was terrified somebody else would get there first with this idea. Thankfully I finally fired up the laptop (only just yesterday) and here I am. Plus, over the passing of time my ideas matured, developed and evolved. 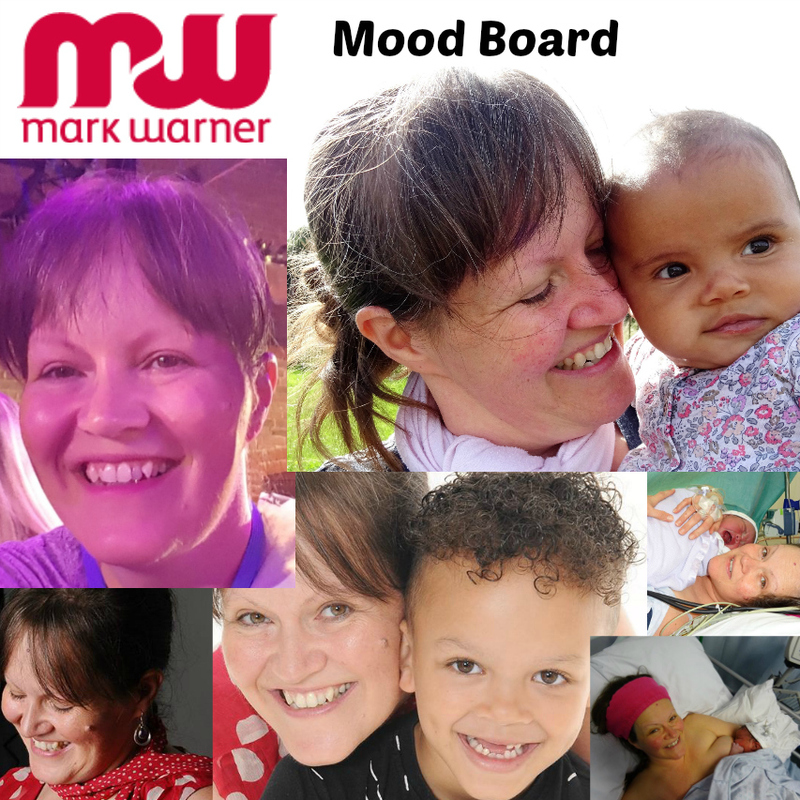 I give you 10 boards illustrating 10 moods, both their good side and their bad. 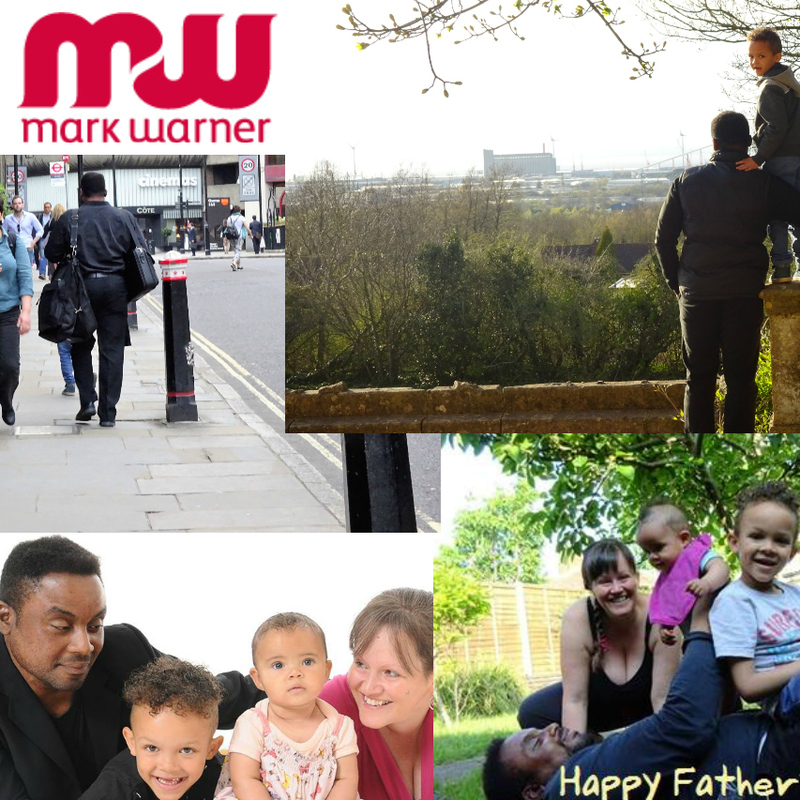 The moods that can be resolved by a great Mark Warner Holiday. 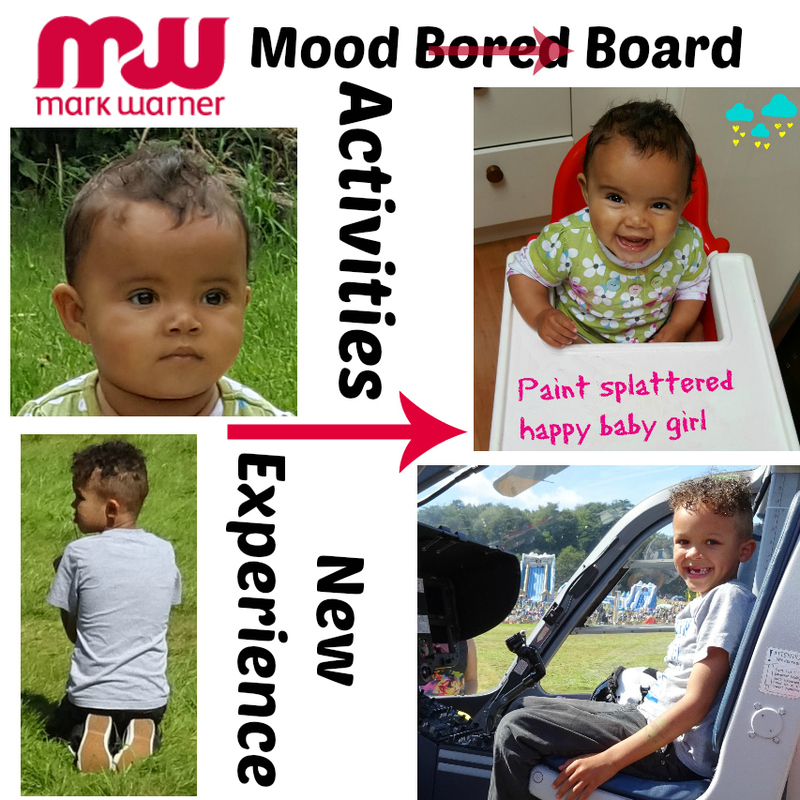 A holiday in the sun with Mark Warner would see us using the Toddler Club for Lottie and Junior Club for Aaron providing a wealth of activities and experiences so that they would never be bored. 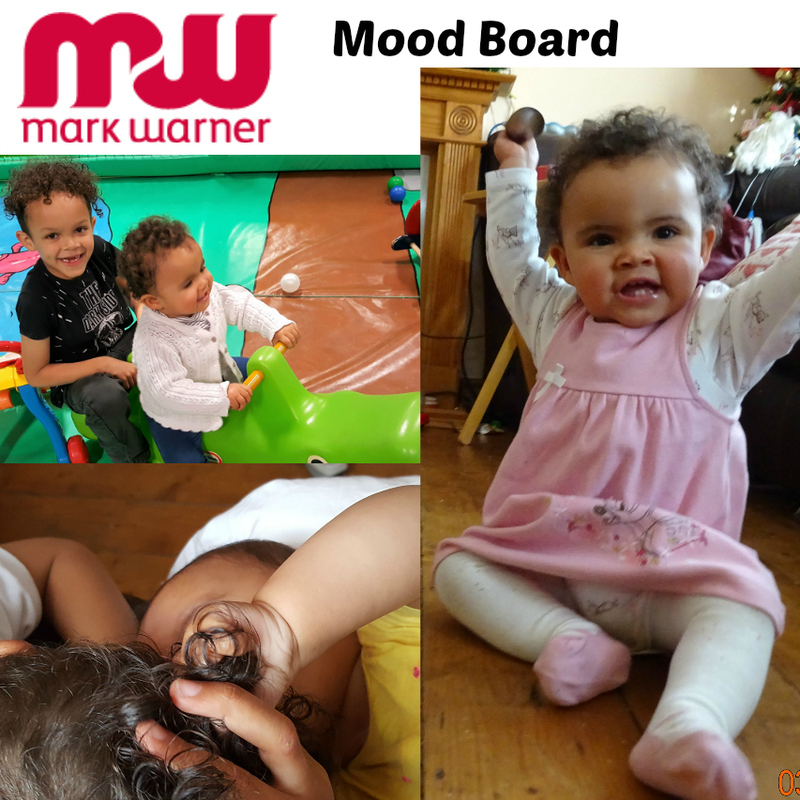 This would release Mummy from being their cheerleader every hour of every day and Mummy could get a well earned #MarkWarnerMum rest :-) I am a stay at home Mum who believes in attachment parenting, so this is something that would be life changing and a holiday in every sense of the word. Daddy works long hours and we have no family nearby (mine, including my Mum, are in Ireland), so I would avail of the childcare, of course I would. Lottie is breastfeeding so I'm not saying she'd be in there for the full quota, but I'd certainly get some Mamma me time. Each morning and afternoon session is tailored to include a good balance of outdoor and indoor play, ever mindful of the heat of the sun and energy levels of a toddler. Our Toddler Club is very well stocked with a superb range of toys to keep the most active of toddler occupied and stimulated and a morning or afternoon session usually consists of 2 outdoor and 2 indoor activities. As you can see above, the kids are really joyful once they've arrived at their destination. Although I haven't shown a plane, train or coach in these photos above, I have picked them for their authenticity as they were genuinely their faces (on the left) at the beginning of a real life journey and on the right at the end, at the destination. 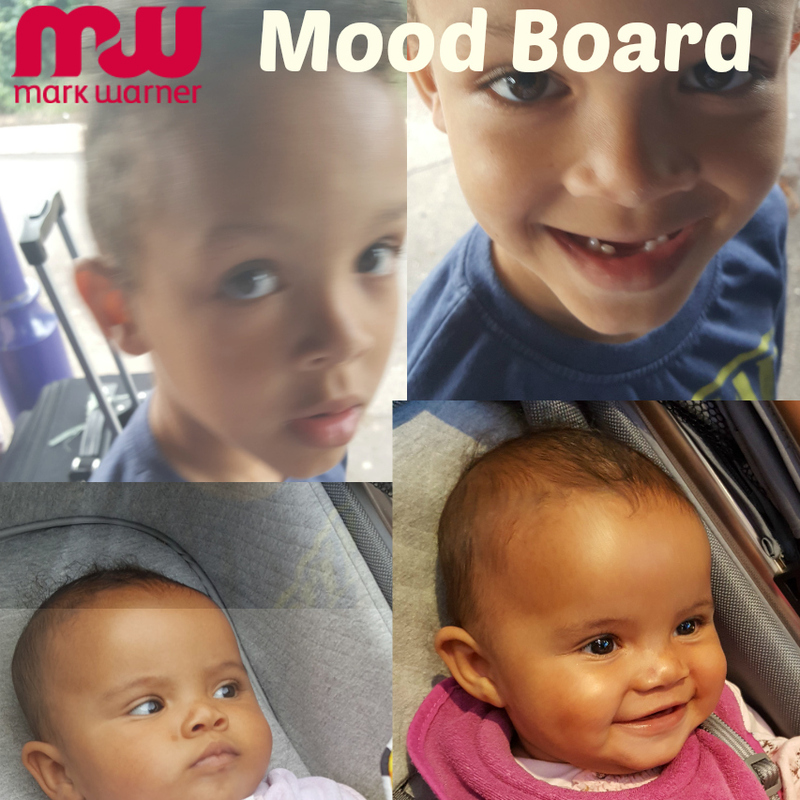 This blog post is *all* about the emotions - the moods. Private coaches are used for transfers between the airport and resort. On occasions we may use other Tour Operators coaches but there will always be a Mark Warner representative at the airport to assist. Approximate transfer times are below, but these can vary according to traffic or weather conditions. On some transfers a short stop is planned for refreshments. After the thought of flying with 2 young children, reading the above is like music to my ears. When we get there, we want to GET THERE. Luckily my kids are good travellers, but it's how taxing the journey is on this Mamma that is the problem. Greek Taverna In July and August, dinner is also served at no extra charge in the poolside Greek Taverna, serving local dishes including hot and cold mezes, grilled meats and fish. Full board upgradeIf you opt to upgrade to full board (for a supplement of £90 per adult and £77 per child per week, booked prior to arrival), lunch is also included in the Amalthia restaurant in peak season and in the Annora restaurant or the pool snack bar in low season.Room ServiceThere's also a reasonably priced room service menu with Greek salad, burgers, pasta and more. 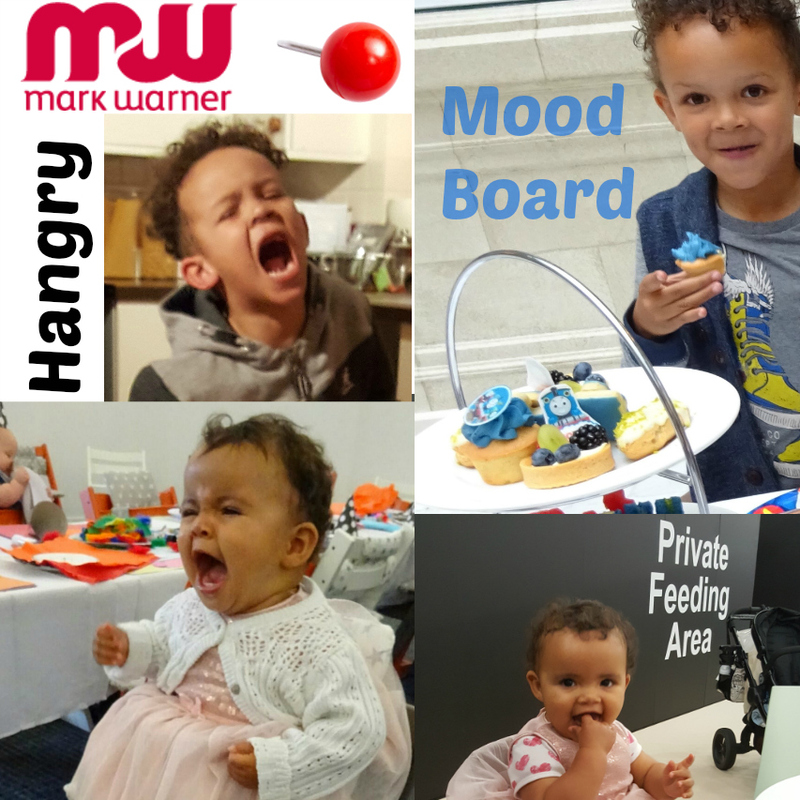 I love the word hangry and with children it explains a lot which is good because it is easy to forgive their behaviour when we know exactly what makes them tick and more importantly it means we can meet their every need. I've often seen people over the years having waffles or pancakes for breakfast and got a real "wish I was there" moment. The food is definitely one of many things that Mark Warner has to offer. bad-tempered or irritable as a result of hunger. "I get very hangry if I miss a meal"
Childcare is excellent at all resorts, giving you time to relax by the beach or pools. To be fair, when Lottie is tired, only the breast will do, but I'll be on holiday with her, so no problemo. Our sleep routine, in a sunny luxurious environment will be bliss. Children have so many questions don't they? Lottie learns by exploring, crawling and now walking. She also explores taste and feel by putting EVERYTHING in her mouth. Aaron learns by asking lots and lots of questions. Other parents warn you that they'll spend a long time saying "why?" to everything but nobody prepared me for the "How?". A few months ago it all started: "How do you know that this is the train that goes to London?" and "How do you know that we should get on it at 4 o'clock?" and "How do you know that means we'll be at Grandma's by....?" and so it went on. 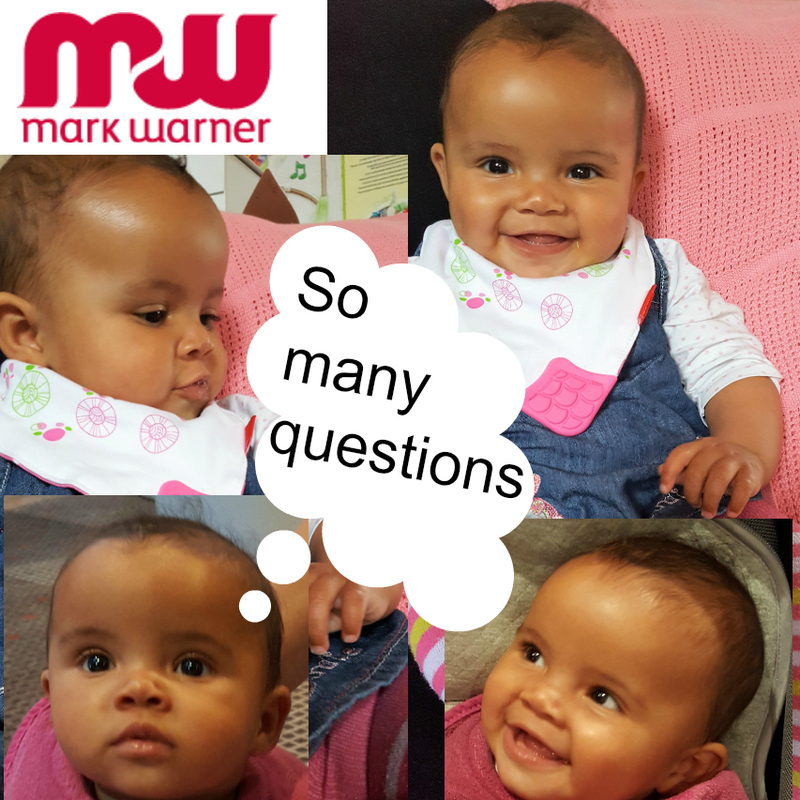 I'm not saying that Mark Warner will provide all the answers, although the childcare team will no doubt answer all of Aaron's questions whilst he's in their care. But what I love is that the holiday will provide more reasons to be curious "what's over there?" "how do you windsurf?" "What time does the tide come in?" etc... More reasons to be curious and more reasons to learn. Plus the quality time for it all to take place. And as you'll probably have guessed, those 10 moods will result in me determining the 10 travel essentials. Things that address those moods. Things that a Mark Warner holiday would provide, that make be chomp at the bit to be considered. Here's hoping and here's to having a commercial break (get it?!?!? ;-) ) until I work out what those 5 other moods/solutions are. Given that childcare comes as standard and is one of Mark Warner Holidays' USPs, then this is what I would be looking forward to. I was going to leave it till the end, till number 10 mood, but it felt like the elephant in the room, and with Valentine's Day being so so recent, I just wanted to put it out there, I'm starved of romance. I've now had a wee taste of it and want me some more. Come to Mamma Daddy-oh. Coughs. I think I'll leave it there. This is a competition entry and 10 Shades of Travel Essentials not 50 ha ha! With a sun holiday with Mark Warner, we could get on a plane and leave the dishes, the sink, and the humdrum behind. A holiday of a lifetime for our little family. I can feel it in my bones how wonderful it would be and I have spent 4 years watching what a fabulous time their holidaymakers have. Think of it as a game of Home and Away. I've experienced home I want to experience away. A self catering holiday (like Bluestone was) doesn't allow me to leave the kitchen, the cooking and the dish washing behind. I don't have a dishwasher (I'm it) so a complete break, a complete get away, would be bliss and so appreciated. I've never been on a sun holiday with Aaron let alone Lottie. It would be heaven. Lottie soaks everything up like a sponge at the moment. It would blow her mind. She's now walking, exploring and loves the water. 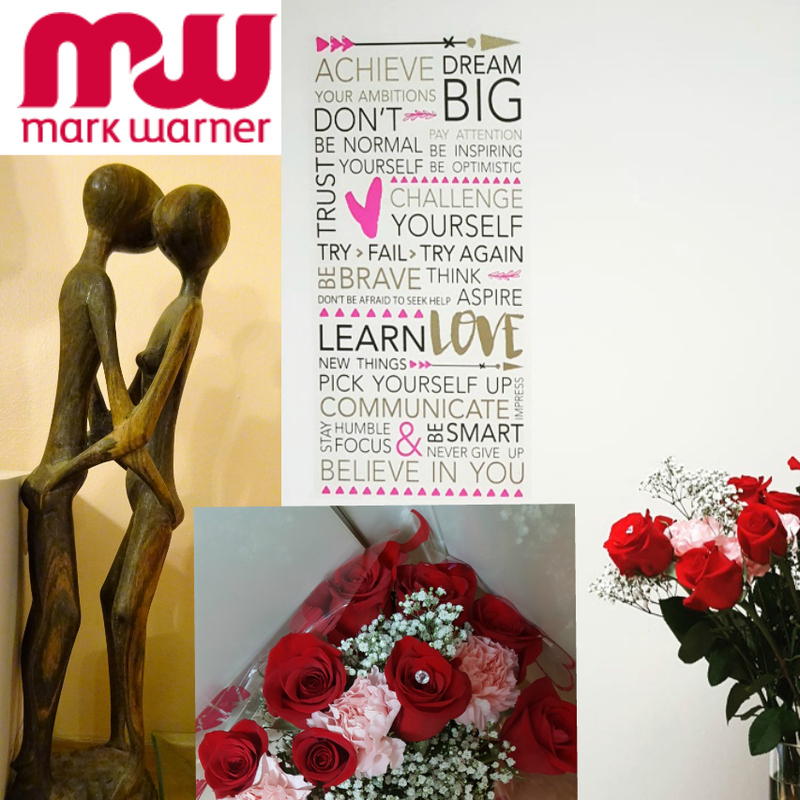 I know she'd thrive with me as her #MarkWarnerMum and Aaron. Oh My God Aaron, he is so appreciative of every experience he has in life. We went to Bluestone Wales in April 2015 and he talked about the Lazy River outdoor swimming pool for months. After school he always has a packed lunch for the journey home. Today I packed more than normal as he'd been in after school club. His little face lit up better than it does for Santa. To see his reaction to a resort and a sun holiday.... I think I'd cry. He wouldn't want to come home. He's such an adventurous outdoor boy and I know he'd dive in with all of the activities that they do in the clubs. He'd miss his Sister though so we'd spend lots of time as a family too. By bringing us all together. Isn't that what holidays do? Ah but the beauty of this one is that ordinarily Daddy, being the breadwinner, would pay for the holiday, so he'd choose somewhere with a climate he likes, like Scandinavia, if only we could afford it... 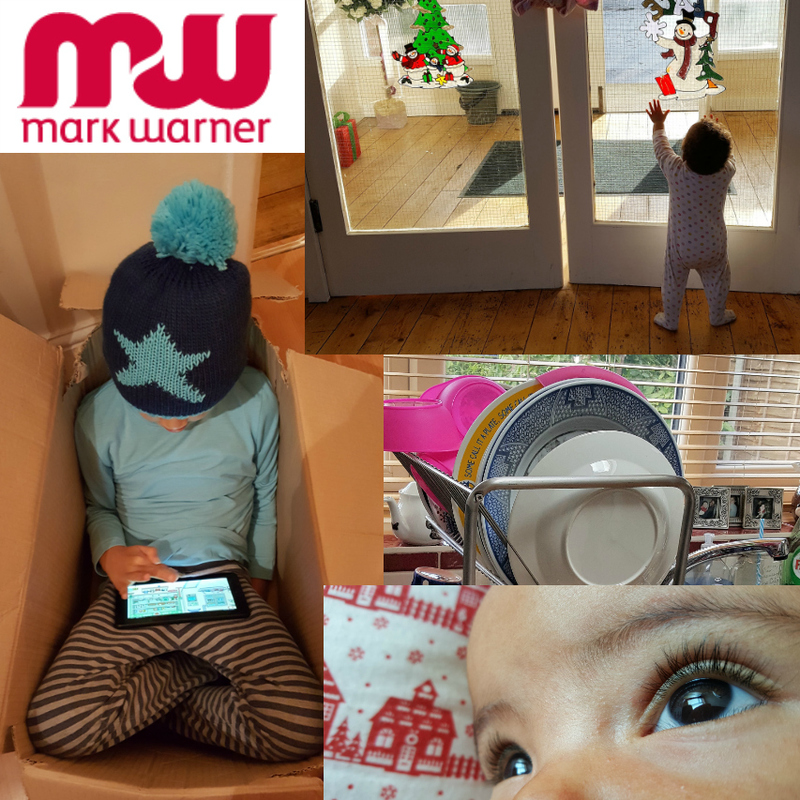 The beauty of winning a Mark Warner holiday would be that we could go on the sort of dream *sun* holiday that I long for, and the kids would get that resort kids club experience I know they'd so benefit from. Daddy is not the sort to look a gift horse in the mouth plus he REALLY needs a break, so we'd get our kind of holiday and Daddy would be off the hook. I know he would LOVE it anyway. What's not to love. Plus we don't have to go at the hottest time of the year anyway and I've done Malta with him and Poland when it was at its hottest. He copes. He stays in the shade and takes pictures of me from there ha ha! By having the two of them in 2 different ages of kids club. To be fair they'll miss each other terribly as they are incredibly close (but they'll probably be having too much fun to notice). She was so young in that picture above when she pulled his hair she really didn't know what she was doing but it did briefly upset Aaron. No, the trouble with these two is that Lottie is now walking so she'll march on over to what Aaron's playing with and take it off him. Also if he catches her with one of his toys when he tries to take it, she screams and refuses to let go. This is all new to him as she'd previously always let him take things off her but she's coming into her own now my little Lottie. Plus we go to a LOT of baby groups so she's getting used to having to stand her ground with the many "snatchers". The reason I'd be glad that they are separate in their two different age groups of childcare on a Mark Warner holiday is because I think Aaron deserves, out of school, to have fun with his own age group. He helps me with Lottie so so so much, he's earned any bit of fun or adventure that he gets. He'll go get me nappies from upstairs. He'll watch her while I have a shower and he'll watch her while I cook. 9 times out of 10 he doesn't grumble and only does if she's acting like he's not enough or if he is in any of the moods listed above LOL. By getting us out in the great outdoors. By us taking part in such an active holiday that is bursting with the opportunity for exercise. The fresh air. The sunny Vitamin D. The sea air. The happy endorphins, quality time. The whole kit and kaboodle. Which is why this is mood 10. Boy do we need it, we've taken it in turns to be sick since October and I have had enough now, of sickness and of Winter, especially as we're normally fabulous at fighting things off. The rash above was an allergic reaction Aaron had to a spider bite. 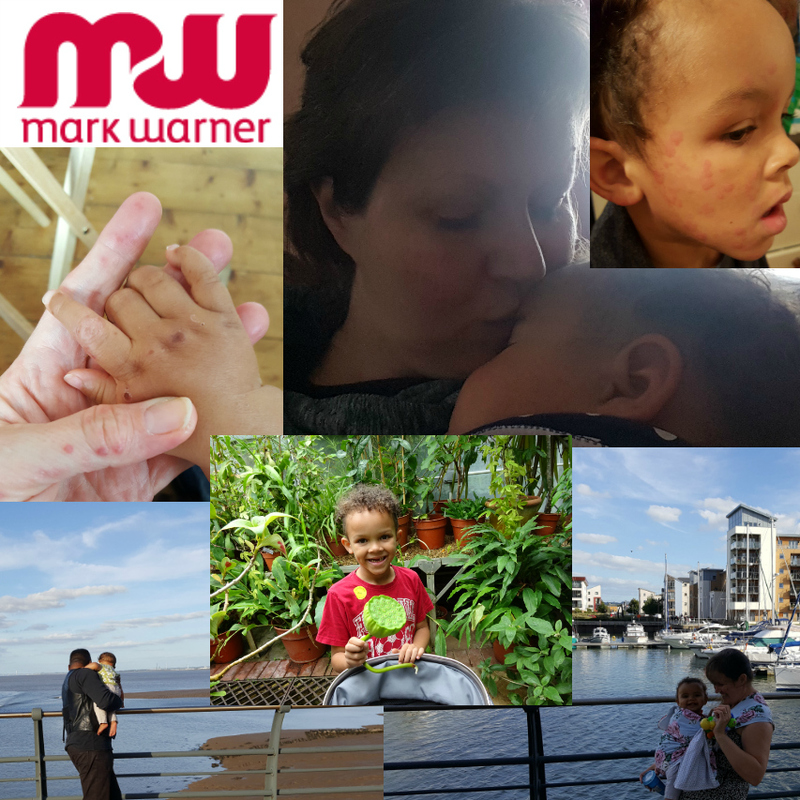 When me took him to A and E (we thought it might be meningitis) Lottie played with the toys there (I brought her as I'm breastfeeding) and she contracted Hand Foot and Mouth, which she ever so kindly shared with me a few days later. That seems like such a long time ago now, at the end of the Summer. This "mood" takes me back to bygone days when Doctors would literally prescribe that people spent some time on the coast, to get some sea air in their lungs, hence us having some great coastal piers and hotels in this country. Royalty would literally go to see the sea for a holiday. Plus Royals opened many piers. I know Weston Super Mare even had a royal, Princess Anne open the new Pier when the old was destroyed by a fire. But I digress. Except you'd be right in saying it is just a collage of the moods I have explored and not technically "travel essentials" as per the Ambassador Programme competition brief. Well....... 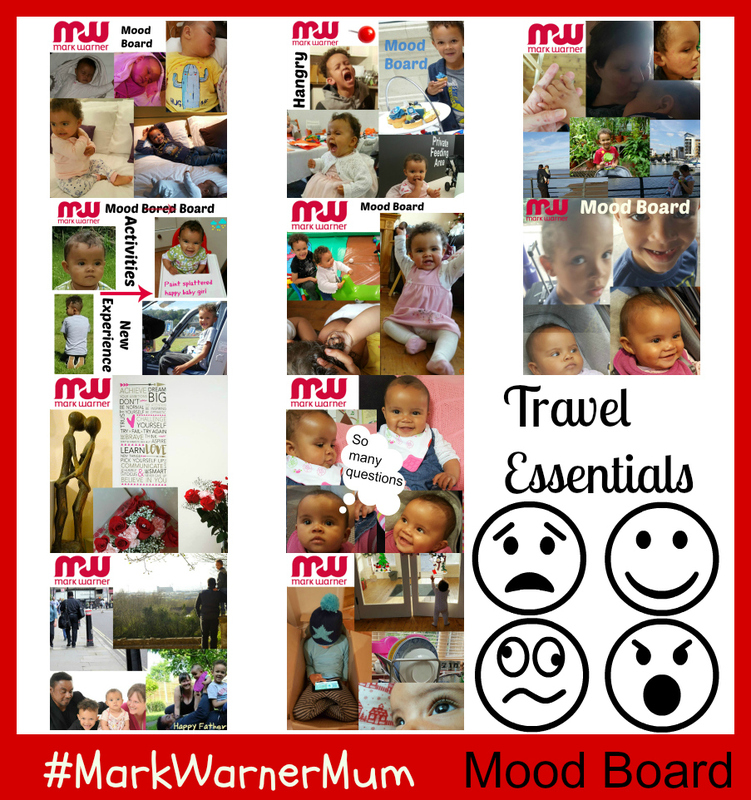 I have now added the travel essentials that would ensure that these "moods" don't occur. 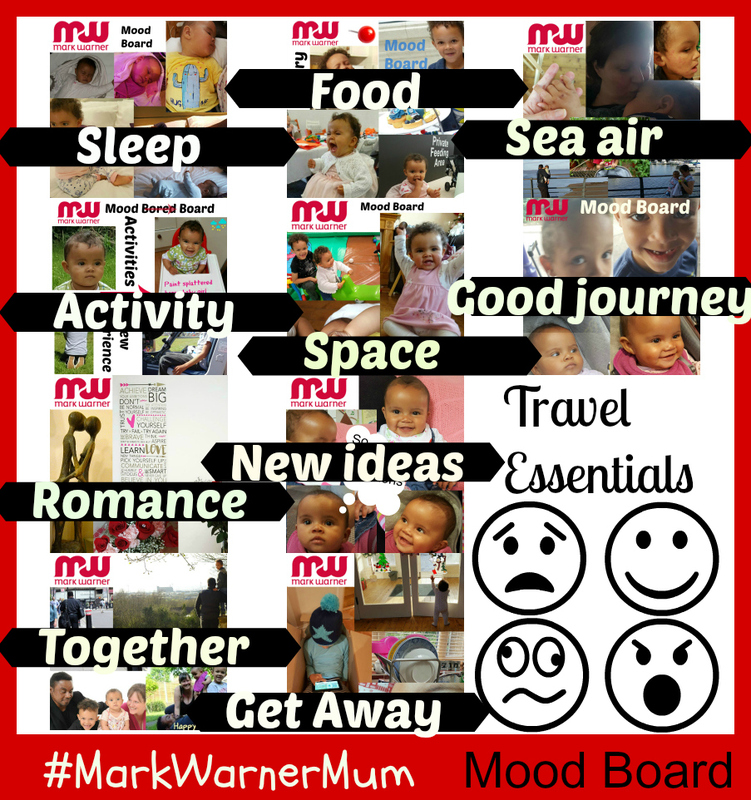 All of which being travel essentials that Mark Warner provides in abundance. So here really is the final mood board. GOSH there's been a big build up to this and I don't mean the long blog post above. There has been brainstorming and drawing. Notes on paper, notes on the phone. Sleepless nights tossing and turning, grabbing the phone to "memo" a mood I've just thought of. I've been working on this in different guises since the day the Ambassador Programme competition begun. But it was only yesterday that I fired up the laptop, and was brave enough to see what my idea would look like in reality. The original idea WAS always about MOODS but originally each mood had a colour but I moved away from that as the idea evolved and here is my final masterpiece. NO glue guns were harmed in the creation of this mood board. No pencils or scissors were blunted. NO glitter was used... but the same amount of creativity took place nonetheless, only it was digitally (if you don't include my drawings).